Our Sunset Grand Canyon EC-130 Helicopter Tour is a unique way to experience the breathtaking beauty and romance of the Grand Canyon. Touring the Grand Canyon in helicopters isn’t exactly new, but it’s a once in a lifetime opportunity to view the Grand Canyon in a way that truly captures the essence of this awesome landmark. For thousands of years the mighty Colorado River has been winding its way through the Canyon and carving itself deeper and deeper into the landscape. The result? An awe-inspiring formation that reaches a length of 277 miles, a width of 18 miles, and a staggering depth of over 5,000 feet in some portions. You begin your tour around four hours before sunset it Las Vegas where a stretch limousine will arrive at your hotel door to collect you. Relax and enjoy the style and comfort of the limo while you are chauffeured to a private heli-pad and the real adventure begins. Between the panoramic aerial views that you’ll experience and the romantic Champagne picnic that is included with the tour, this adventure offers a near perfect blend of style, romance, and luxury. 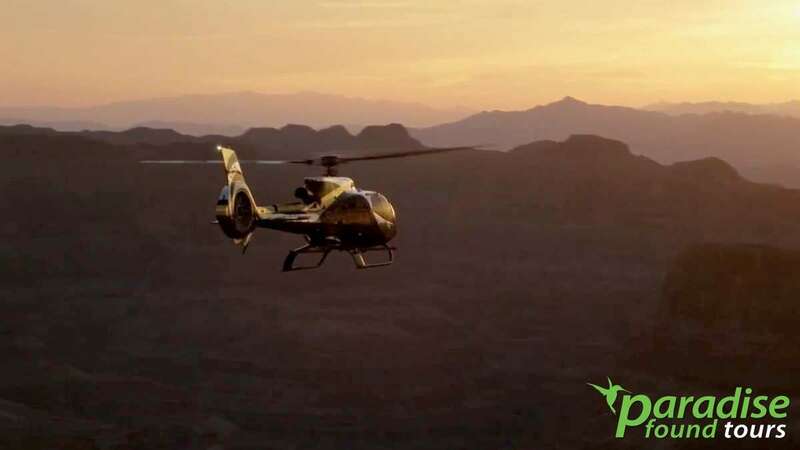 As you tour in all the style that comes with a million dollar helicopter, you will get a great view of some of the finest resorts on Las Vegas Boulevard, as well as views of the West Rim and magnificent Hoover Dam. This amazing helicopter tour gives each visitor an opportunity to get an up close experience in areas of the rim that were formerly inaccessible. Your helicopter will descend some 3,200 feet below the canyon’s rim and land so that you can enjoy the complimentary Champagne picnic that your pilot will host. You will also be able to spend some time enjoying the many natural landmarks and unusual rock formations that make the Grand Canyon one of the most magnificent places on earth. You will linger at the canyon until the sun begins to set and paints the sky with shades of red and orange as a backdrop for your return journey. You will fly above the City of Lights and enjoy a spectacular birds-eye view of Vegas from the luxury of your helicopter. Hover above New York New York, Paris, The Bellagio, Caesar’s Palace, and many more amazing sights before passing the space beam at the Luxor Pyramid on your return. After landing, you will be driven by a chauffeur to your hotel, taking with you memories that will be treasured for a lifetime. Chauffeur driven limousine pick up and drop off. Amazing views of Las Vegas, Hoover Dam, and the Grand Canyon. Land in the Canyon for a complimentary romantic champagne picnic. FREE Upgrade to one of the new EC-130 helicopters. Memories that will be treasured forever. We are now offering travelers a FREE upgrade to a deluxe EC-130 aircraft. These helicopters are 23 percent larger than normal ones and are fitted with theater-style seats and a wraparound windshields. The upgrade is a $25 value, now yours FREE! Hotel Pickup: Hotel pick up by a stretch limousine is included with the tour. Please inform as to which hotel at the time of the booking. Tour Length: Flight from Las Vegas to the West Rim is 45 minutes with 35-to-40 minutes on the ground. This is followed by a 45-minute flight covering more of the Grand Canyon West Rim then back in Vegas for a 10 minute hover over city lights. *Providers of our services reserve the right to substitute air craft based on operational needs (e.g. off season maintenance, etc.). In the interests of safety and comfort, it will be necessary for passengers exceeding 275 lbs, (124.7kg/19 stone), to purchase an additional seat at the applicable retail price. Passengers must re-confirm their body weights at the time of confirmation of the applicable helicopter tour. Photography for personal use is OK when authorized by pilot. Commercial photography must be done on charter flights only. Kids age 2 and under fly free. They must also be safely secured on the lap of a parent or guardian. Kids older than 2 will be required to pay full fare. Helicopters hold a max of 6 people per flight. Please indicate if you will be celebrating a special occasion and we’ll arrange to make it extra special. Additionally, you can pre-order a cake for $10.